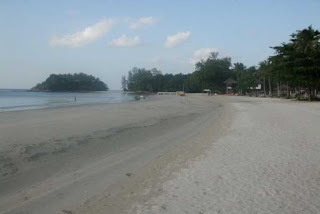 Setokok Beach is located at Setokok Island, a small island after Nipah Island connected by Barelang Bridge. It is about 1Km away after the 3rd Barelang bridge, turn right to follow the paved path, winding and hilly around 2 Km. The journey from Mukakuning about 45 minutes or 1 hour from Batam Center. You can enjoy the views of small hills and the blue expanse of ocean along the journey. When morning time arrived at the Setokok Beach, the sea is still receding. The view of white sand with ocean waves lapping lightly. Blowing waves leaving a trail like a beautiful painting on the soft sand beach. A beautiful color combination of white sand beach, blue sea and green Island which are scattered around Setokok Beach.